New polls show that Democratic candidate Hillary Clinton is leading her Republican counterpart Donald Trump in at least three swing states and now has a 10-point lead over him nationally. The polls come as Trump faced an outcry from both his opponents on the democratic side as well as from within his own party over comments made about the Muslim parents of a slain U.S. Army Captain. Clinton leads Donald Trump 45 percent to 42 percent in Arizona, a state that voted for a Democratic presidential candidate only once in the last 64 years. Phoenix-based OH Predictive Insights surveyed 996 likely voters on Aug. 1 in a poll that included Libertarian Gary Johnson and Green Party candidate Jill Stein. The Democrat is leading in Michigan, one of the key states in deciding this year’s presidential election. Clinton leads 41 percent to 32 percent according to a poll conducted Saturday through Monday for The Detroit News and WDIV-TV. Three in five likely voters in the state said in the poll that they believe Trump not to be qualified to be president. In New Hampshire, another battleground state, Clinton leads Trump by 15 points—47 to 32 percent—according to a recent WBUR poll conducted after the Democratic National Convention. Three months ago the presidential race was virtually tied in the state. The recent poll included Johnson and Stein, but if the two are omitted, the Democrat’s 15-point lead bumps up to 17 points. The poll also found that the same number of people viewed both the Republican and Democratic conventions, however, 56 percent said that Clinton appeared stronger, compared to 39 percent who said Trump did. 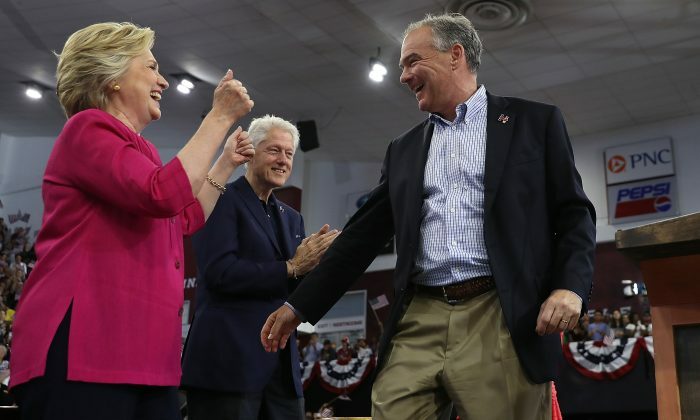 Pennsylvania, a key state in which both Clinton and her running mate Tim Kaine toured after the DNC convention, is also leaning towards the Democrat. Clinton is ahead of Trump 49 percent to 38 percent among likely voters, the July-August 2016 Franklin & Marshall College Poll of Pennsylvania released on Thursday shows. Almost two-in-three, 62 percent, of those who watched the DNC convention said they were more likely to vote for Clinton, compared to two-in-five, 40 percent, of those who watched the RNC convention said they were more likely to cast a ballot for Trump. The Clinton-Kaine ticket is beating the Trump-Pence ticket by 10 points—49 percent to 39 percent—according to a national Fox News poll conducted after the conventions. A month ago, Clinton was leading Trump by six points, 44 percent to 38 percent. The poll shows Republicans are divided by their party’s candidate. Fifty percent are happy with Trump, while 49 percent would rather have someone else, the poll finds. Twelve percent of Republicans back Clinton, while only five percent of Democrats support Trump. When it comes to Trump’s recent comments about the parents of a Muslim-American U.S. Army captain, 77 percent of voters are familiar with the feud between Trump and the slain soldier’s family. Some 69 percent of them say Trump’s criticism of the Khan family was “out of bounds.” Among Republican voters, 40 percent say his response was “in bounds,” while 41 percent think he was “out of bounds,” and 19 percent are unsure. Trump still has a lead over Clinton among veterans, 53-39 percent. Other polls conducted after the DNC convention released this week show Clinton ahead of Trump. An online poll conducted by NBC News/Survey Monkey shows her on the lead by 8 points over Trump, 50 percent to 42 percent, up from a single-point difference last week. The CNN/ORC International survey shows Clinton surpassing Trump by 9 points, 52 percent to 43 percent. The poll is a turning point for Clinton after trailing behind Trump the previous week as he led by 3 points—48 percent to 45 percent. A CBS News poll has Clinton on the lead by six points, 47 percent to 41 percent. In a surprising Utah poll, a state which has voted Republican for decades, a Hinckley Institute/Salt Lake Tribune survey shows the Democrats in the lead. Clinton is ahead by one point, 36 percent to 35 percent, according to KUTV.